This customizable boutonniere feature double stacked white spray roses, accented by gold sheer ribbon, eucalyptus leaf and white limonium. 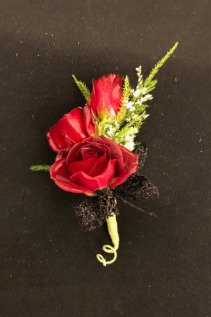 See the matching corsage in Prom Flowers! Call the shop at (208)323-7738 to customize and place your order! 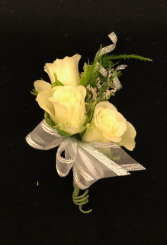 This triple stack white spray rose boutonnier is accented by silver accent ribbon curls and white limonium. 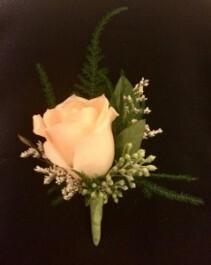 See the matching corsage in Prom Flowers! Call the shop at (208)323-7738 to customize and place your order! This customizable triple stacked red spray rose boutonniere is accented by white limonium and black glitter ribbon. See the matching corsage in Prom Flowers! Call the shop at (208)323-7738 to customize and place your order! 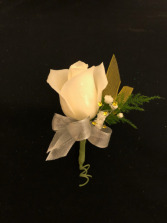 This customizable single white rose boutonniere is accented by metallic silver ribbon, yellow accent ribbon, baby's breath and yellow crystals. See the matching corsage in Prom Flowers! Call the shop at (208)323-7738 to customize and place your order! **Baby's Breath may not be available at time of purchase. Please see our other boutonnieres and corsages to see what our usual white limonium filler looks like. 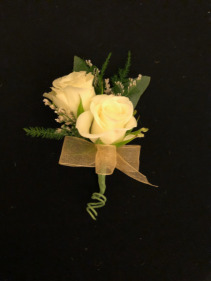 This single white rose boutonniere is accented by black ribbon, white limonium and silver accent ribbon curls. See the matching corsage in Prom Flowers! Call the shop at (208)323-7738 to customize and place your order! A touch of blush softens this wild garden looking boutonniere. 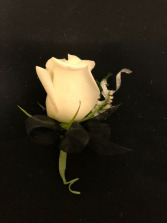 Call us today at (208)323-7738 to order and customize this boutonniere to fit a color of rose or filler to your attire! 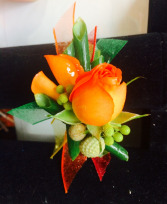 This unique modern boutonniere features an equisetum backdrop with an orange spray rose blossom, frenched orange spray rose petals, brunia and brazillia berries and red, orange, green and yellow ribbon accents. Call the shop at (208)323-7738 to customize and order! **this boutonniere features tropical accents that may not be available at the time of ordering, but we always suggest similar items to make sure you keep unique design similar to the picture! Call for details. 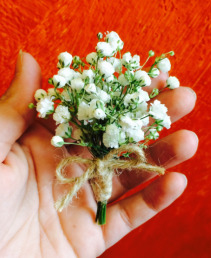 This all baby's breath boutonniere features a twine wrap and bow for a rustic touch. Call the shop at (208)323-7738 to customize and place your order! Don't forget the boutonniere! Sure, prom season is overwhelmed with all-things girl, but it's a big night for guys as well. HEAVENESSENCE FLORAL & GIFTS in Boise can help you choose the right flower boutonniere for your special date. No matter what you're style or budget, we can help!